I was off down to London to work for my old company and as I left I didn’t know what time I would get finished this evening. However on route I realise that I will have free time so I look for something to do. 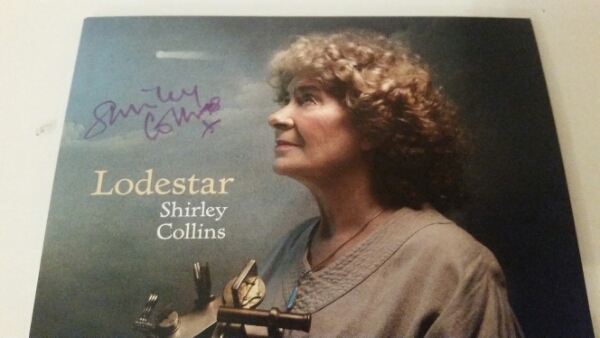 I can’t believe my luck when I find that Shirley Collins is doing an in store appearance at Rough Trade East and all you have to do to get in is buy a copy of her album! That’s no heartache as I would have bought it anyway. I order it on line and enjoy the rest of the journey looking forward to seeing her for the second time. 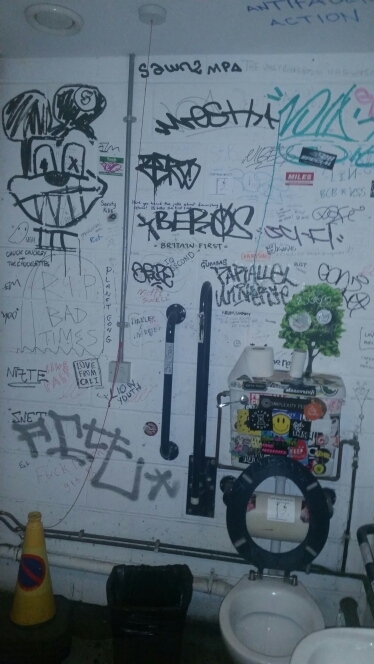 I finish what I have to do and go to the hotel to check in before heading out to walk to the station and catch a tube over to East London and the to walk down to Brick Lane and Rough Trade East. 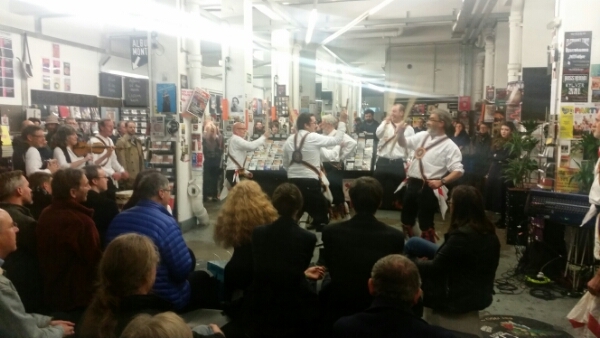 As I enter the shop there are Morris dancers performing between two racks of CDs. It turns out that they are Brighton Morris Men and part of the show that I’ve come to see. Although they are dressed in white there doesn’t seem to be many hankies on display and most of the dances involve sticks. I try and work out where to collect my record and the wrist band for the event although I do think that I may not have needed to buy anything as there don’t seem to be any checks going on. Still I wanted the LP anyway and at least it made the decision for me. A man points me to the desk down the side of the shop where I’m handed a bag containing an LP to which a wristband has been taped. 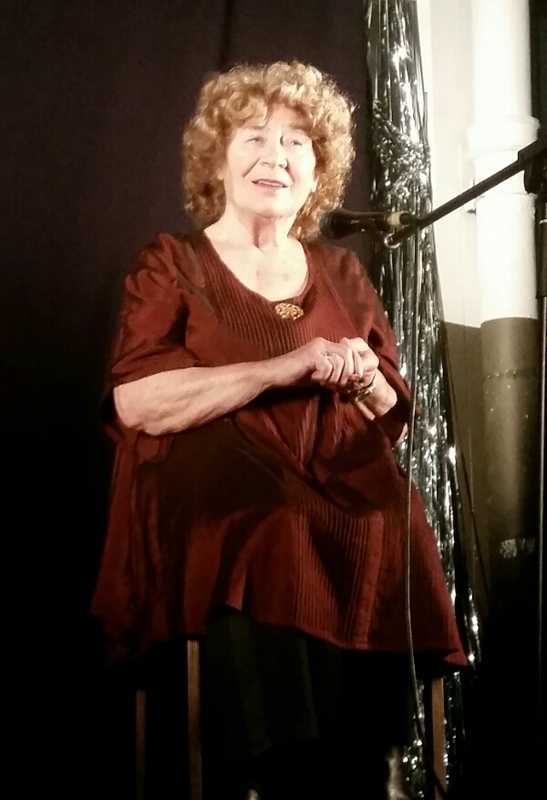 I move over to the other side of the room to watch the Morris dancers and spot that Shirley Collins is already sitting on the stage at the end of the room. While I’m stood there I have a stroke of luck. A man comes and put some more benches down just behind me so I plonk myself down on it knowing that when the dancers finish and the performance begins I can just swivel round and I’ll be in the front row! Which is exactly what I do! 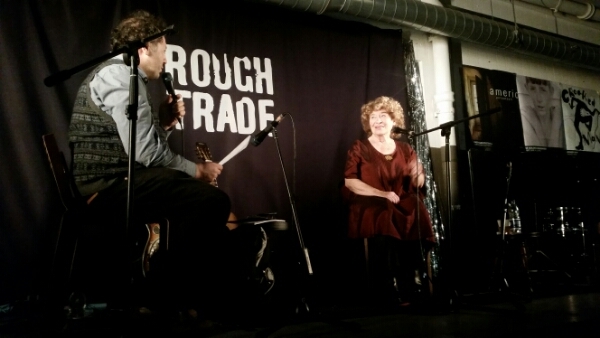 The evening continues with a Q&A from the stage – there’s a guy who I think I’m supposed to know who he is who asks the questions and Shirley Collins answers them. It’s really interesting to hear her talk, I knew some of the story but as the interview unfolds the history of her life, she’s 82, is told and she’s had quite a life. The only thing that isn’t covered is why she stopped singing all those years ago except that she said that she just couldn’t do it anymore. I find that her daughter is standing next to me during the conversation! 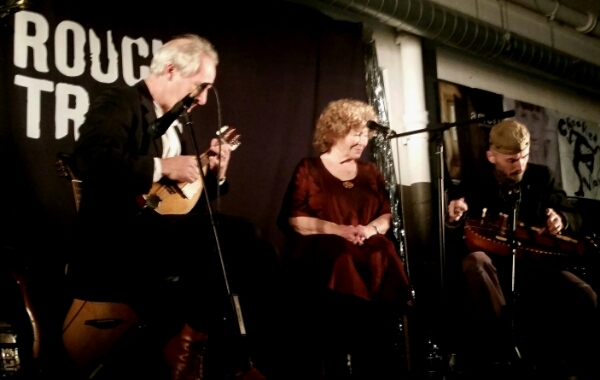 Then finally the interviewer gives away and the musicians join her on stage. 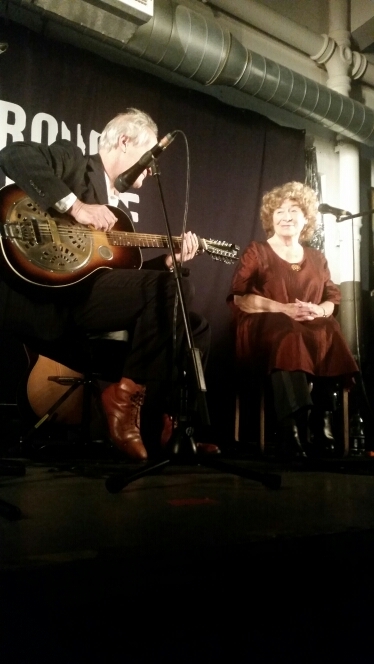 Playing with her tonight is Ian Kearey who I saw with her at the Current 93 Union Chapel gig a couple of years ago. He plays mandolin and guitar. Also there is Ossian Brown on Hurdy Gurdy and he is wearing a really cool hat! 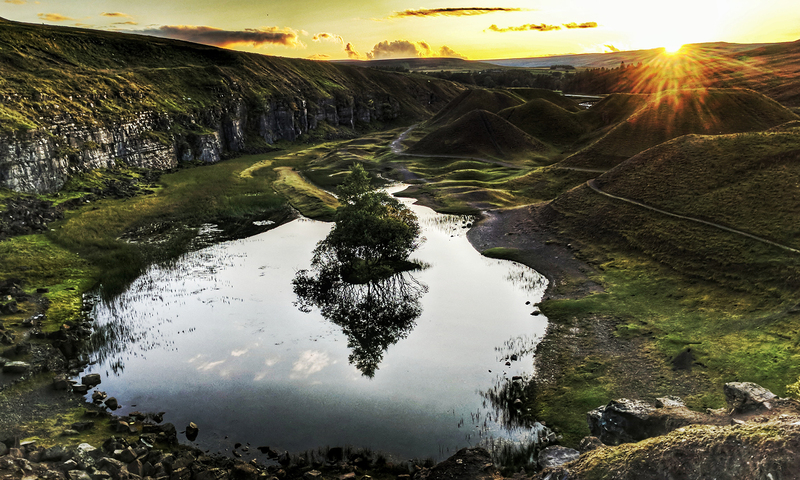 They play three songs Awake Awake>The Spilt Ash Tree, Washed Ashore and Death and the Lady. 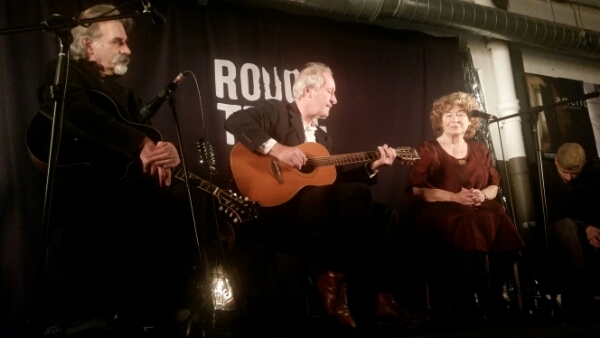 After they finish the last song they are joined by another musician and they do a blues version of Death and the Lady! During the song Shirley sings My name is Death, D, E, A, T,H in the syle of Muddy Waters and then on the second time round she sings My name is Death, T,R,U,M,P much to the amusement of the audience! Afterwards there’s s queue to get albums signed so I wait patiently till it’s my turn. She thinks she recognises me (she’s not the first person to say that – I must have a doppelgänger! ) 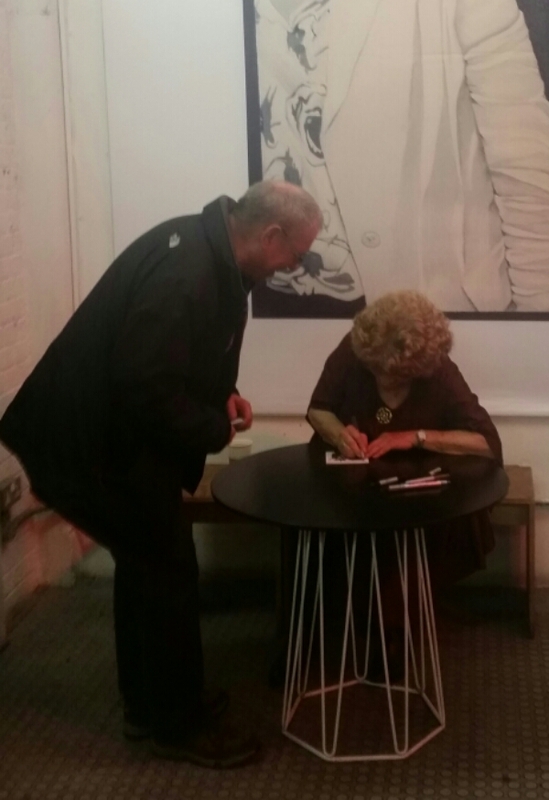 and we chat while she signs both my album and CD. Then after a visit to the interesting customer toilet I head off out into the night. I walk back up Brick Lane past loads of curry houses and it’s not until I’m on the train that it dawns on me that I haven’t eaten and a curry would hit the spot quite nicely. Then I remember the curry house near to the hotel that smelled so nice earlier and decide to head there. When I arrive there is a short wait and eventually I’m put in what looks like the second worst seat in the house but in the end it’s not so bad! The food is fantastic and I can’t remember eating such a lovely meal for quite some time! Afterwards I head back to the hotel.